Congratulations to the winner of Caption Contest 45, and recipient of a custom black and white illustration of whatever he likes -- Lyogi! Runt82: I told you kids to get off my lawn! Fishpants: The arrow goes THAT WAY. And next time bring like 2 or 3. Check back later today for the next Caption Contest and your chance to win your own professional illustration! yes! you liked it, why no make it? It was funny, just not as funny (IMHO) as the winner. My general gauge is, if I laugh out loud the first time I read it, it goes on the list. If I laugh out loud the SECOND time I read it, it’s usually the winner. Which I did with Lyogi’s. 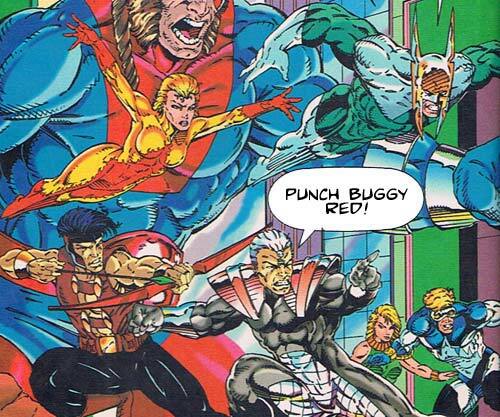 Just something about all that power and grimacing playing a game of Punch Bug hit me the right way. I don’t get it. What is “PUNCH BUGGY RED”? Is it a quote from a movie? It’s this stupid game you play while you’re in the car on a family trip. When you see a VW bug you shout out “PUNCH BUGGY!”. If you’re the first to call it, you get to punch the other players in the arm. If you see a red one, it’s “PUNCH BUGGY RED” and you get TWO punches. Etc. Okay. Now I get it. He’s punching Stringless Bow Man in the ribs because he saw a red VW.